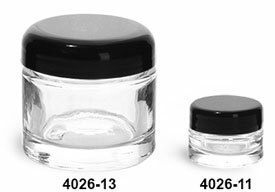 Our 1/4 ounce and 2.3 ounce thick wall cosmetic jars come with a black dome F217 lined cap. This is sold in cases of 48. The glass jars could be used to package all kinds of cosmetics, powders, creams, and much more!